1 September 2017 - postponed! 25 September 2017 - postponed! The Milky Way is an unique testbed for our understanding of galaxy formation and evolution because it is the only galaxy for which we can study its properties to the highest level of detail and accuracy. Nonetheless, we still lack basic observational constraints on the structure and formation of the central Galactic components such as the bulge and the bar, as well as their interaction with the Galactic center. In fact, the study of the three-dimensional and dynamical structure of the central components of the Galaxy is strongly hampered by the high extinction towards the Galactic plane and by the extreme crowding of the innermost regions. These limitations are even more severe for the regions located beyond the Galactic center. 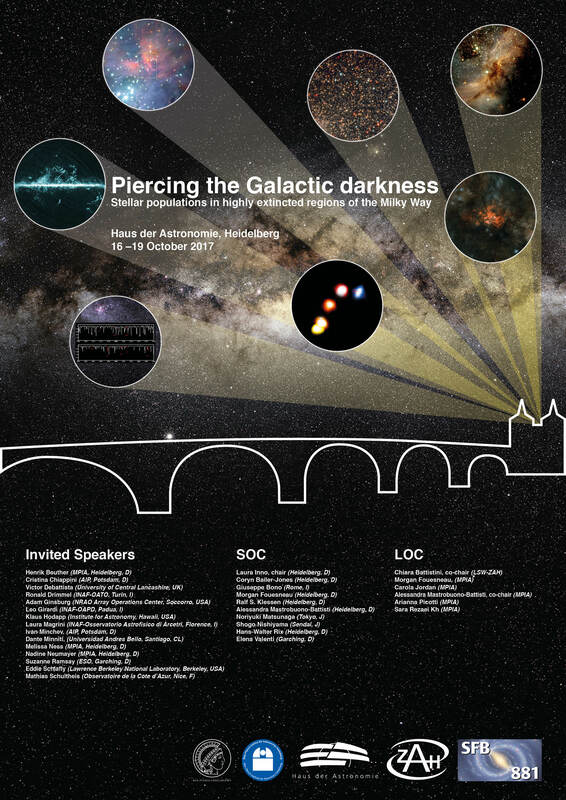 This conference aims at reviewing the state of art on our understanding of such obscure Galactic components and at making interdisciplinary connections (from stellar populations to ISM physics and Galactic models) to determine which improvements - in methods, models and observing facilities- are needed in order to overcome the current limitations. The conference will be hosted at Haus der Astronomie, in Heidelberg. This conference is funded by the SFB 881 "The Milky Way System" project.